If you work in The Park in Chodov, you're familiar with The Club House. 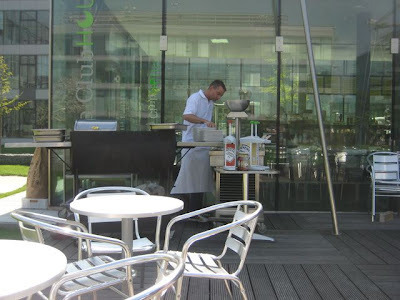 It's a small, modern cafeteria-style restaurant in The Plaza in the middle of that modern, glass-clad office park. But it's not just for desk drones, managers of middles, the IT crowd or masters the universe. I don't work in The Park, but I've eaten there several times when visiting some of its many business establishments. There are plenty of reasons to be there besides work. The complex has a fitness center, a hair salon, the Canadian Medical Center, and it is walking distance to the massive Chodov mall. Then, there's the pedigree: The Club House is run by Zátiší Catering, which is related to the Zátiší Group's gourmet restaurants. 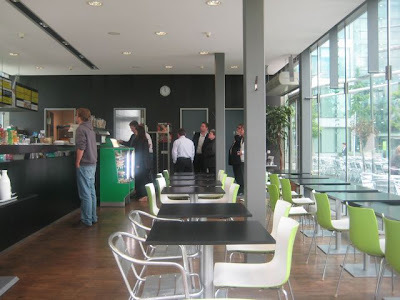 Other points of interest: The Zátiší people do the food at a number of other venues like Žofín Garden on the river, and they are now running the cafeteria at the International School of Prague. Seeing as how one of these Zátiší operations might soon be coming to a location near you, I thought it worth taking a closer look at what they do and how they do it. 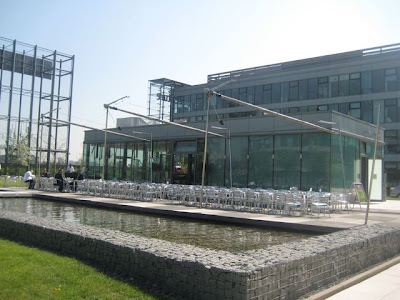 In addition to the nice deck, fountains, and reflecting pool, the restaurant has an unusual landscaping addition: a putting green. 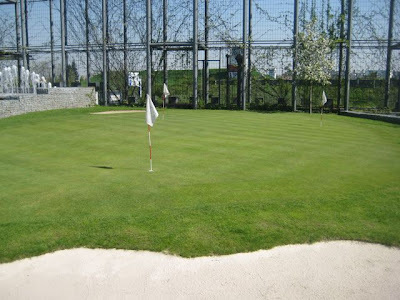 You can rent a club and balls from the restaurant and work on your game. You can, but I wouldn't. It is hard for me to imagine standing up there perfecting putts in front of office workers during lunch. 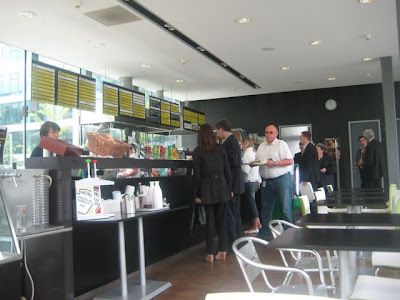 The restaurant itself has a simple shoebox design with glass walls that fit in well with the rest of the office park. Lines form at peak times, but they move along quickly. The eatery is only open 10 a.m. to 6 p.m. on workdays. With summer rapidly slipping away, I'll start with the best offering there: Their outdoor grill. I've enjoyed their barbecue on many occasions. 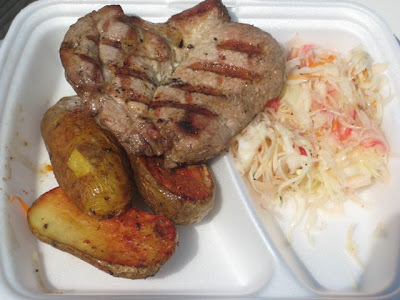 For around 130 CZK, you get meat, potatoes, and a salad, usually coleslaw. I really enjoyed the beef. 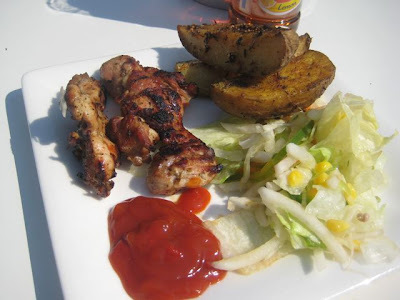 But they also have had delicious pork and chicken. The meats always have great charred edges or grill marks and the smoky flavor I love so much. I'm not a big fan of their coleslaw. 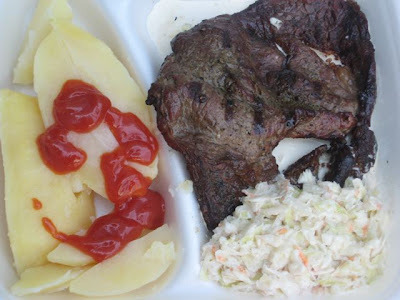 I don't like how the mayo runs off into the meat and potatoes. And I don't like seeing it sit out in the sun for so long on a hot day. The pizza looked like a popular choice. It was 34 CZK for a quarter of a small, thin-crusted pie. I didn't like it. 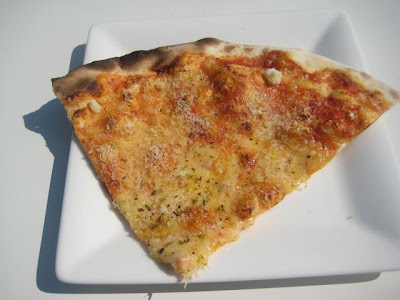 The slices usually sat under a heat lamp and lost almost all crispness. They were too salty and not well-sauced. The cheese tasted too much like parmesan and not enough like mozzarella. One time, I tried one of their hot lunch specials. 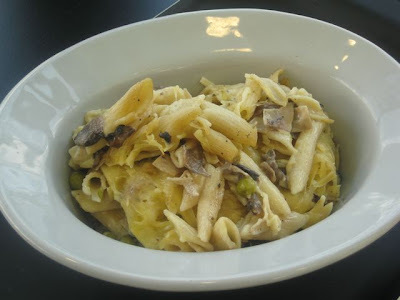 This time, it was baked penne pasta with a cheese sauce, chicken, mushrooms, and peas (125 CZK). It was pretty disastrous. The cheese cooled quickly, and turned it into one giant blob with the penne. On top of that, it was very bland. Luckily, there was a bottle of Tabasco sauce available. I used a lot. There were very simple, boring-looking sandwiches that were pre-made in a display. They didn't look worth trying to me. However, I did go to a Zátiší-catered event once at the Congress Center, and they had a much more interesting sandwich selection. I recall a Mexican-style sandwich with actual guacamole. Not fantastic, but better than what they offered at The Park. The Club House also had pre-made Caesar and Caprese salads (49 CZK). Another hot lunch special was meatballs with tomato cream sauce and macaroni. This was better than the chicken pasta, but not by much. The meatballs were very dense and salty, but edible. The sauce, which had some cranberry on top, was understandably on the sweet side. The macaroni should have been salted, but was not overcooked. 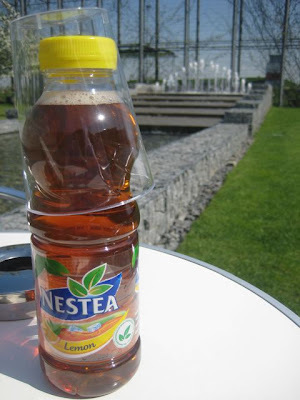 For a drink, I usually had a half-liter bottle of Nestea (30 CZK). I'm a big dessert guy, so I tried their chocolate brownie. It was chocolaty enough, with a dusting of cocoa powder. But that powder also made it a mess to eat. And unfortunately, it was fairly dried out. I also had their muffin with the chocolate center (24 CZK). 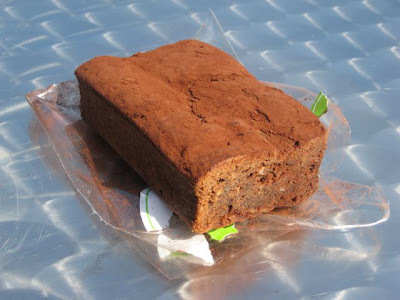 This was moister, and I liked the fudgy middle. It was better than most muffins you'll find around town, but it still had something of a mass-produced style to it. I'd say the Club House is a pretty average cafeteria in a pretty building in a pretty, manicured landscape. The food has a fancy look and presentation, but all too often, it's a bore. 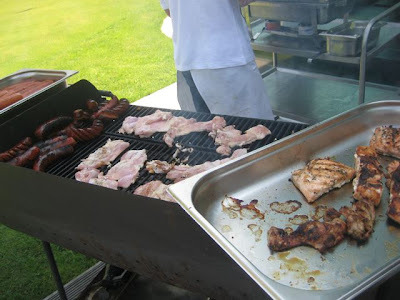 The bottom line at this spot in Chodov is if you see the grill fired up outside, The Club House is the place to be. If not, you might be better off rising politely and taking a friend to the pub for a liquid lunch. Praha 4 review, thank you. If the grill is on, i would like to try it. Do not like coleslaw much, myself. Just listened to " one on one" on Radio Praha, about food critic " The Prague Spoon". Found it interesting, people do not realise how hard the job can be. Keep up the good work!.